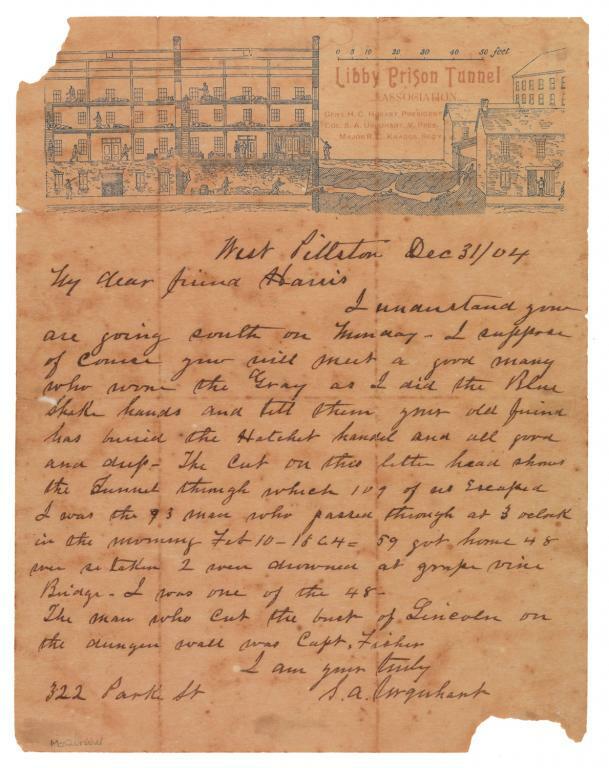 Correspondence between individuals plays an important role in our understanding not only of how people communicated in the past but also of what they thought about their world. A hint of a person’s motivations or personality can also be interpreted through the letterhead they chose to use. In 1904, Samuel A. Urquhart wrote to a friend who was going to be traveling south. As vice president of the Libby Tunnel Prison Association, Urquhart mentions being one of the 109 Union prisoners who escaped through the tunnel in February 1864. From the letterhead, we not only learn where the tunnel was located but also get a rough idea of its length. But more importantly, we learn that forty years after the escape, there was an association dedicated to the memory of the ordeal. In another expression of the ordeals of war, we have a letter written by Robert E. Lee to his wife, Mary, on April 18, 1847. Lee writes from one of Santa Anna’s haciendas telling her that the U.S. Army has achieved a great victory and, most importantly, that he is safe. On what paper does Lee write his letter? Whether by design or necessity, he writes on the letterhead of the private secretary of the president of the Republic of Mexico, thereby punctuating the U.S. victory. Before the ease and popularity of photography caught on, people in the nineteenth century had little opportunity to share the sites of their city with those who could not travel to it. However, George M. West of Richmond helped alleviate this problem. He sold stationary with an engraving of Richmond’s Capitol Square and identified the landmarks. Within the engraving we can see church steeples that are no longer present, buildings that have since been demolished, and we have a greater appreciation for how the Richmond skyline appeared in the mid-nineteenth century. By the early twentieth century, printing technology had improved and costs had decreased. Thomas P. Deitrick & Co. capitalized on this with his colorful and lively stationary. In one corner, a serviceman and a female companion stroll past a wrought iron gate. In the opposite corner, a convertible drives in a bucolic setting. Being a wholesale fancy grocer, Thomas Dietrick’s marketing slogan, “Classify your car with diamonds” is somewhat puzzling. Thomas P. Deitrick to Mrs. H. W.